A-frame coupler features a thumb latch for safe, easy hookup. Simply push latch down and slide forward or back to open or close ball socket. Black powder coat finish provides durability and rust resistance. 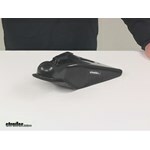 Call 800-298-8924 to order etrailer a-frame trailer coupler part number CA-5400-B or order online at etrailer.com. Free expert support on all etrailer products. 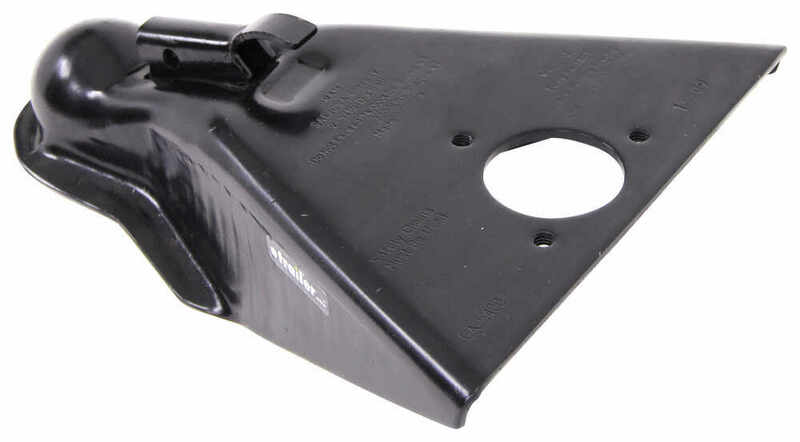 Guaranteed Lowest Price and Fastest Shipping for A-Frame Trailer Coupler - Thumb Latch - Black - 2-5/16" Ball - Weld On - 14,000 lbs. A-Frame Trailer Coupler reviews from real customers. A-frame coupler features a thumb latch for safe, easy hookup. Simply push latch down and slide forward or back to open or close ball socket. Black powder coat finish provides durability and rust resistance. Minimum span needed for pin or pin lock: 7/8"
A-frame coupler features a wraparound yoke latch that catches to remain open while you position coupler over ball. Black powder coat finish provides strength and durability. Coupler is made of sturdy steel with a durable, rust-resistant primed finish. eZ-Latch ensures fast, easy, secure hookup and disconnect - drop coupler onto ball to hookup, lift latch to disconnect. 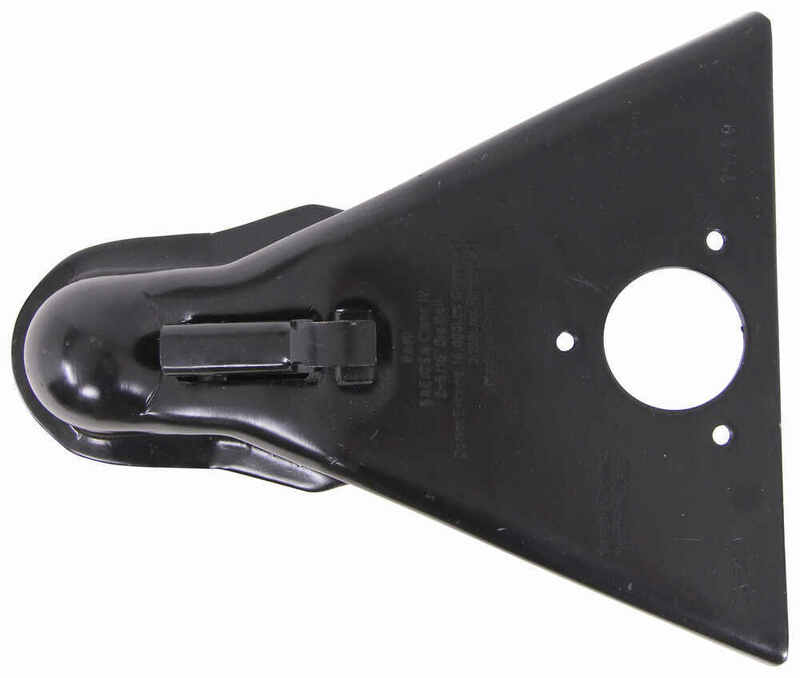 Cutout in plate fits 2-1/4" round jack. Durable cast coupler features the easy-to-use Wedge Latch for simple, quick hookup and has a built-in attachment point for round, A-frame utility jacks. Today, we're going to be taking a look at the a-frame trailer coupler for a two and five-sixteenth inch hitch ball. The a-frame coupler's going to let you hook up your trailer to your tow vehicle. This is a weld on installation and it's going to provide your connection point for your two and five-sixteenth inch hitch ball. The coupler's going to feature a gross weight capacity of fourteen thousand pounds with a maximum of tongue weight capacity of twenty-one hundred pounds. It's also going to feature the thumb latch mechanism. That's this part right here. 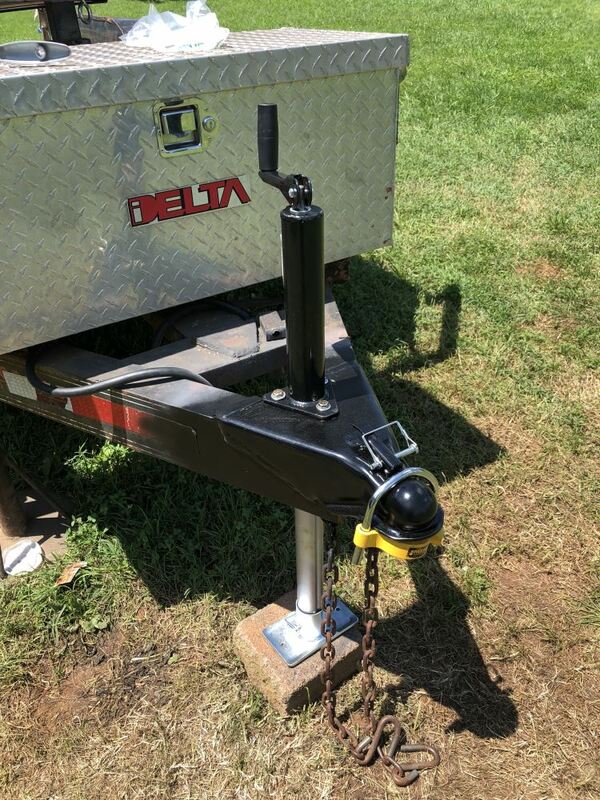 Makes it very easy to clamp around the hitch ball for a nice tight secure connection. In order to open up the socket, all you have to do is place . I like to place an index finger underneath. Thumb on top, lift up and then pull it back. It's got a nice little groove right here that the latch sits in so that way it remains in the open position without any extra pins and clips or without having to hold it open. It's going to do it on it's own. It's a really nice design. That opens up the socket area, right here. That way we can drop the coupler on top of our two and five-sixteenth inch hitch ball. Once we have it in there, we want to connect it. All we have to do is lift this up, it's going to slide back and then all the way down. That's going to secure the hitch ball inside the socket. The unit's made from a steel construction. It's going to feature a really nice black powder coat finish with is going to offer really great protection from rust and corrosion. Here at the back of the coupler, you can see that this right here is going to be the attachment hole for the a round utility jack. That's going to give us a diameter of two and one quarter of an inch and it's going to have three threaded mount holes for your round utility jack. We're going to take a look at some of the overall dimensions real quick starting with the overall length. From very back to very front, that's going to give us a measurement of about twelve and seven-eighths of an inch long. There's a couple different width measurements that I want to do with you. We're going to go overall so outer edge to outer edge. That's going to give us an overall width measurement of about ten and seven-eighths of an inch. Next, what I want to do is inside edge to inside edge. That's going to give us a measurement of about ten and three-eights of an inch. Right here on the actual latch mechanism, there's going to be a small pin hole. That's designed to accept a coupler pin or a coupler lock. That pin hole is five-sixteenths of an inch. The minimum span needed, if you interested in a coupler pin or a coupler lock, measuring from this point here to this point here, that's going to be seven-eighths of an inch. 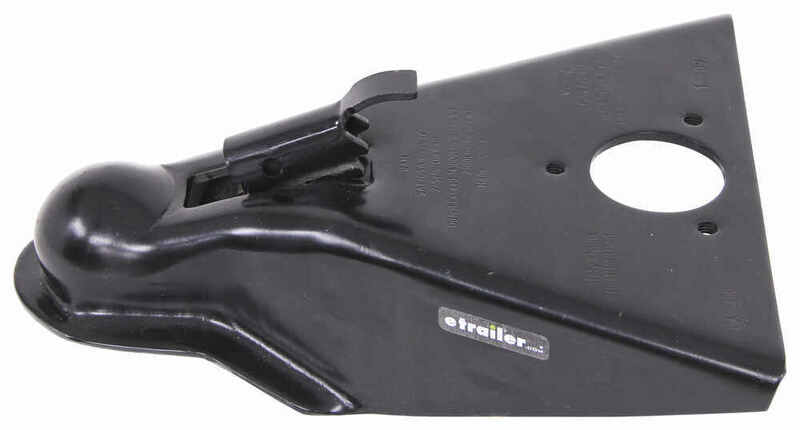 If you are in need of a coupler pin or a coupler lock, they are sold separately and can be found right here at etrailer.com. That's going to do it for today's look at the a-frame trailer coupler for two and five-sixteenth inch hitch ball. Order: RelevanceNewestRating - High to LowRating - Low to High A-frame coupler features a thumb latch for safe, easy hookup. Simply push latch down and slide forward or back to open or close ball socket. Black powder coat finish provides durability and rust resistance. Do you have a question about this A-Frame Trailer Coupler? We have all sort of trailer locks including coupler locks for a-frame trailer couplers. Please refer to the linked page that displays all standard coupler locks. You can use a universal-fit surround-type lock such as # ML389DAT which fits all ball sizes and that prevents someone from hitching to your trailer by clocking access to the coupler, or a simple latch type lock like # RC6 that prevents the coupler latch (like the one on # CA-5400-B) from being lifted to unlock the coupler. 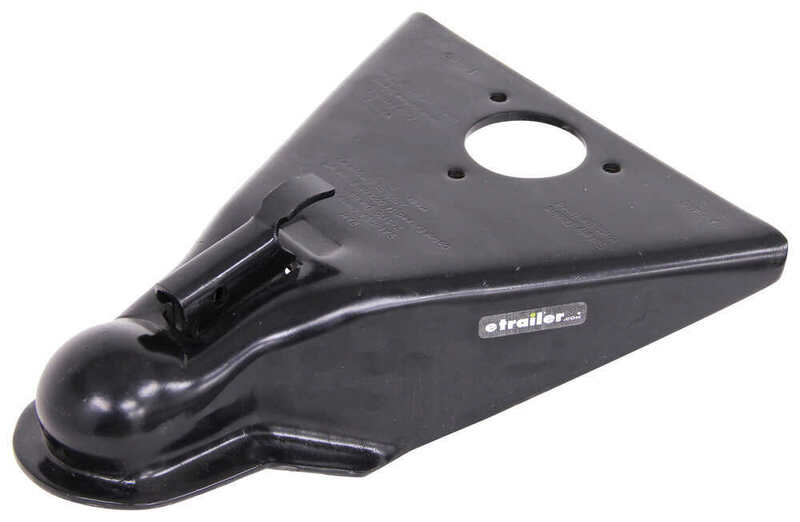 The A-Frame Trailer Coupler - Thumb Latch - Black - 2-5/16" Ball - Weld On - 14,000 lbs # CA-5400-B is designed to fit over the frame of your trailer and sit flat. The angle of the trailer frame to the bottom of the coupler shouldn't change as this is not an underslung coupler. They will be parallel. The angle of the trailer frame side to side is most likely what you are asking and it is the standard 50 degree angle. The oily finish of the A-Frame Coupler with Oily Finish # CA5400 that you referenced is designed to fight off corrosion. But it's pretty messy when handling so I'd recommend going with the painted version part # CA-5400-B instead. How Do I Get a VIN Number For My New Trailer? When you have a trailer with no VIN number, you will need to contact your State Highway Patrol to have them inspect your trailer and issue you a VIN so you can properly register it. 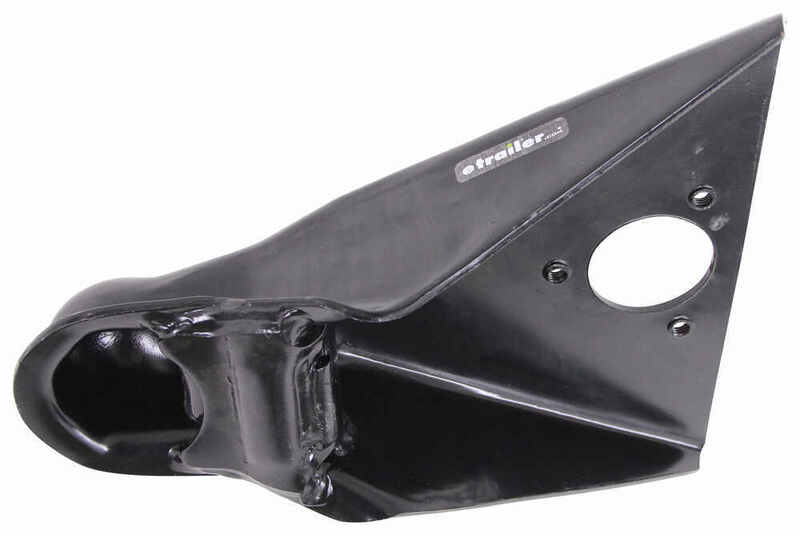 The A-Frame Trailer Coupler - Thumb Latch - Black - 2-5/16" Ball - Weld On - 14,000 lbs # CA-5400-B has an overall dimension of 12-7/8 inches long and about 11-1/2 inches to the center of the hitch ball. The Demco 50-Degree A-Frame Trailer Coupler w/ Jack Hole - eZ-Latch - Silver - 2-5/16" Ball - 21K # DM13205-52 has an overall length of 17-5/8" and about 16 inches to the center of the ball. That will add about 4.5 inches to the length of your trailer for additional clearance. When Does An A-Frame Coupler Need Replacing? An A-Frame trailer coupler like # CA-5400-B is bad and needs replaced if it no longer connects to your trailer hitch ball correctly with its latching mechanism, no longer supports the trailer jack, is not solidly connected to your trailer frame (has cracks), or can't handle the weight capacity it was intended to due to corrosion or impact from an accident. The Replacement Head for Blue Ox SwayPro Weight Distribution Systems part # BXW4011 is for trailers with an overslung mounted trailer coupler like part # CA-5400-B whereas the Replacement Head for Blue Ox SwayPro Weight Distribution Systems part # BXW4012 is for trailers with an underslung mounted trailer coupler like part # CA-5335-B. The tongue weight capacity of the A-Frame Trailer Coupler # CA-5400-B that you referenced is 2,100 lbs. The overall trailer weight capacity for the coupler is 14,000 lbs. 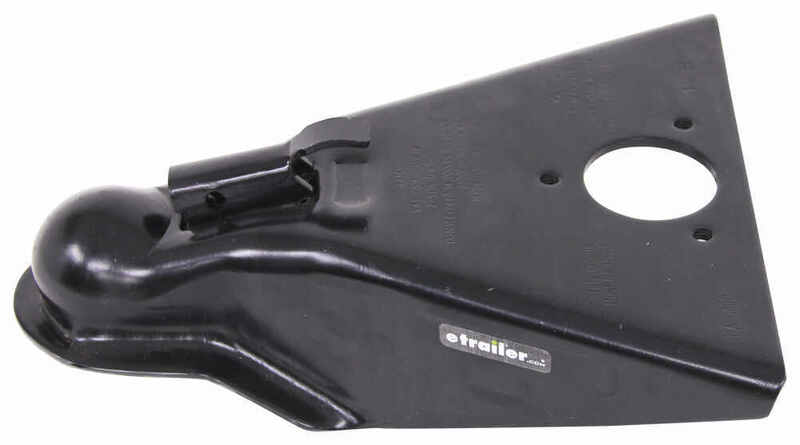 The etrailer # CA-5400-B weld-on coupler you were looking at would be a great replacement for your current Parker Performance A-frame coupler. This coupler has a 2-5/16 inch ball and a weight capacity of 14,000lbs. I have linked this product to this page for your purchasing convenience. Highest quality a-frame trailer coupler for the best price. Most detailed, accurate a-frame trailer coupler information available.